How did you get involved in parkrun? I got involved in parkrun in 2013 after my friend and I took up walking to try and obtain some fitness in our lives. My partner was a frequent visitor to parkrun and I didn’t know what all the fuss was about until I went along! 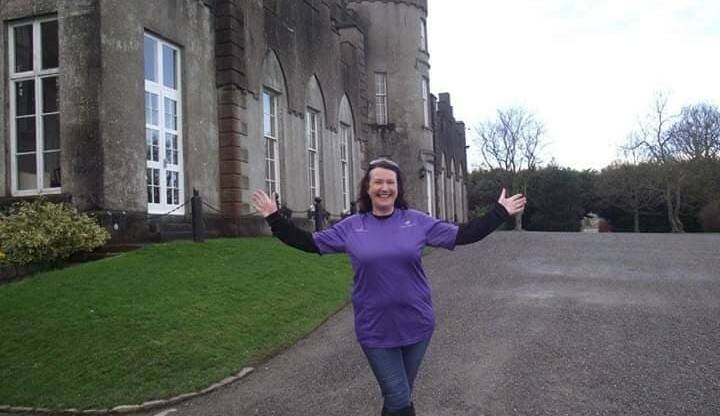 Early 2014 my partner and his friend decided to set up a local parkrun in the grounds of the magnificent Ardgillan Demesne and Castle in Balbriggan, Co Dublin, and I have been hooked since. Saturdays are not the same without a parkrun! What do you love about parkrun? I love that it’s a run, not a race! I love that there are so many parkruns to do in Ireland and different countries across the world. It’s great that it is timed so that you can try and better yourself each week if you wish too. I love the fun and excitement when people achieve personal bests and milestones. The encouragement that parkrunners give to each participant whether it’s their first or 200th parkrun is amazing. I think that is great that parkrun is for all ages and that you can walk, jog, run or volunteer. I believe that it is very good for the community as it caters for everyone and people from all walks of life meet up to join others with a passion for running! Most of all I love catching up with my parkrun family afterwards over a tea/coffee to catch up on the events of the morning and plan some parkrun tourism! Who do you participate with? I take part in parkrun most weekends with my partner, friends and members of our local running group. Sometimes even my daughter and son participate but unfortunately, I am never quick enough to cross the finish with either of them! Any parkrun milestones / achievements you would like to share? Reaching my 100th parkrun was a great sense of achievement, especially as when I had started I thought I would end up volunteering more parkruns than I would run! This was definitely overshadowed earlier this year, while after being approached by my cousin to guide a visual impaired lady on walks/runs we completed her first ever 5km at Argillan parkrun. It was an amazing sense of achievement for both of us and I know it was made easier by the support we received from our fellow parkrunners! How has parkrun impacted positively on your family outside of 9:30am on a Saturday? It has been very positive for both our mental and physical health. Instead of lazing around on a Saturday morning, by 10.30 we all have 5km done and feel much more alert and ready to face the day! There are some weeks I may not feel like doing a 5km, but I have to say after taking part in parkrun, it definitely puts a smile on my face and puts me in better form! We all have made wonderful friends at parkruns all over Ireland and hope to make more friends in the future! Do you have a health or fitness goal? My health and fitness goal is to be able to take part in parkruns and compete in races for as long as possible. By attending parkruns often, I hope to keep my fitness levels up and still be walking/running into my ripe old age! Who is your dream parkrun running buddy? My dream parkrun running buddy would have to be Katherine Switzer. As the first woman to compete in the Boston marathon and therefore allowing women to compete in races I find her inspirational. I have been fortunate to meet her, but I would love to run a parkrun with her, I could just imagine the wonderful story’s she would have to tell as we ran the 5km route! What a wonderful parkrun that would be! What was your best parkrun experience? 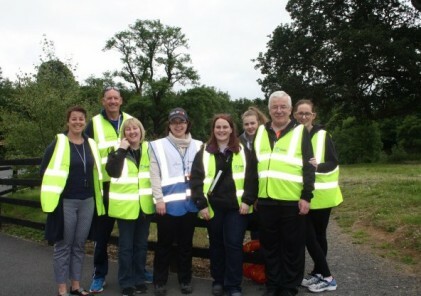 My best parkrun experience was when myself and a few friends headed to Marley parkrun where Operation Transformation was being launched in conjunction with parkrun and we got to meet the founder member of parkrun himself Mr. Paul Sinnott-Hewitt. A nicer guy you couldn’t meet! It was an honour to meet him. Who would think an idea years ago to go for a run with a group of 13 friends could reach the heights it has today? Thank you, Mr Sinnott-Hewitt for making my Saturday mornings so enjoyable! What was the funniest parkrun moment? Funniest parkrun moment had to be when my friend and I crossed the finish line at our 100th parkrun. Not only were we greeted by cheers and applause but by lovely cream cakes straight into our faces lol! We presumed we were going to have a celebratory cake afterwards so to say we were surprised is an understatement! What advice would you give to someone who’s never been to parkrun? It’s one of most enjoyable 5km you will ever do, and I can guarantee you will come back for more! Whether you are young or young at heart, fit or determined to get fit or just want to get out and socialise on a Saturday morning, parkrun is the place for you. When I think of parkrun I think of the three Fs! Free, fun and five km! Best thing about it is that you can never be last (a lot of people do worry about this) as that’s the Tail Walkers job! 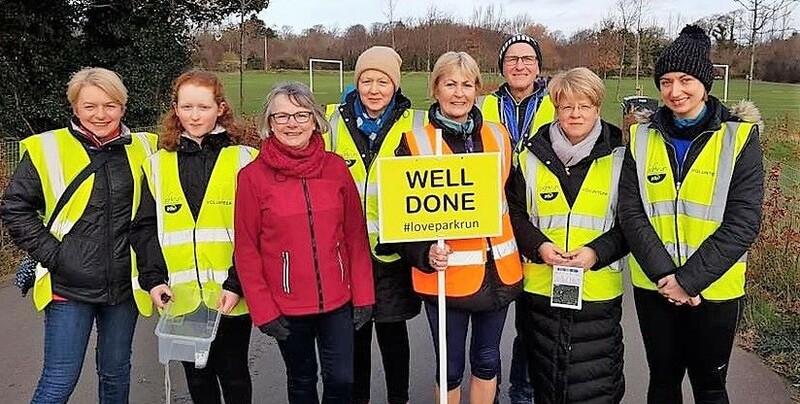 I would advise people to visit their local parkrun and try it out, you might not want to participate but all parkruns need volunteers to keep going every week so why not drop down and help out, you will be very welcome!